Smokehouse Bounty...the gift of all gifts. 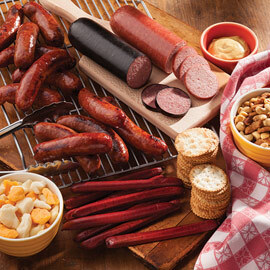 This group of treats is truly a bountiful collection of all our best Amana foods. Your lucky recipient will enjoy everything from meats and cheeses to condiments, relish and more! The Smokehouse Bounty makes an ideal gift for someone special, or order one for your family and enjoy the savory goodies day after day. This year I decided to use Amana Smokehouse for our out of town family. In the past I used a different company each year. The feed back was fantastic. I will no longer be changing companies. I am sticking with Amana. Amana Response: Thank you so much, Joe! We appreciate your comments greatly and look forward to delighting your recipients in the future! Nice variety of products in the package, loved selecting the shipment date and the option to upgrade the gift with discounted "add-on" items at checkout. Everything was tasty, especially the beef sausages. This is a GREAT value and perfect gift idea for those in your life who don't need more "things"! Always enjoy fine meat from Amana. Very quick shipping and so far all products were excellent and of the best quality. Will certainly order again in the future. We ordered 2 of these Smoke house Bounty packages. One for ourselves and one for a relative. Was such a good deal and we have been trying everything and it is delicious. My relatives are very impressed with everything. We will be a customer for life. This was the first time that we ordered from the Amana Meat Shop. Each and every item was just delicious. We would highly recommend this company to others. I sent the smokehouse bounty to my son and daughter-in-law for Christmas. They were thrilled to receive so much great meat with so many choices. They said everything was delicious. 2 weeks later I received a note saying that the seal on the hickory smoked pfefferwurst had failed and had molded in the refrigerator. The date on the package was 5/27/18. I'm hoping they contact Amana directly, but just thought you should know as soon as possible in case there is a packaging error. Otherwise you have a great product! Amana Response: Hi Joan, Thank you for taking the time to send in this review! So glad your son and daughter-in-law enjoyed all the Amana goodies you sent them, but sorry to learn about the bad Pfefferwurst. We haven't heard from them, but will send them a replacement with a note of apology. It will be a great snack for the big game or anytime! Thanks again! my father was so excited when he received his gift. he loved it! This is the first time I ordered but will not be the last. Of the meats I have had, it is the best. I look forward to ordering again. Just a Super box of meat and other goodies !!! The pork chops had price labels scratched off though, so we wondered about their freshness !!! Other wise it was great !!! Amana Response: Hi Shelly, Thanks so much for the feedback. Our smoked pork chops for the Smokehouse Bounty are priced for our Retail Shop and then when we ship out, we scratch the prices off. You are totally right that that it could raise some questions, but I assure you they were fresh. We will try to improve our pricing system here so you don't have to wonder. Thanks again and enjoy! Very pleased with the quick delivery and our recipient really loved it! This is the perfect gift!! It's a great variety of food items from Amana and everything arrived in perfect condition! I recently sent a combination package of ham, sausage, beacon, cheese and mustards to a friend as a Thank You for showing us such a great time while we were on vacation. They called immediately after receiving the package. They were so pleased to receive the gift as it reminded them so much of home. They said it was a wonderful gift that they could not wait to share with their friends. I had many thanks for the gifts sent this year. I ordered from Amana because I had rec'd a gift from a customer and I remembered how good it was so I chose Amama this year as my choice of appreciation to friends & family this year including myself. Thank you!!! just got it, so far outstanding. I have not yet received this order but I have always been totally satisfied with all my orders in the past. The meats are the best. I received the Smokehouse Bounty the day before Thanksgiving as a gift. Oh my goodness...that box of meat was probably the nicest gift I will get this holiday ... except whatever my wife and kids get me....of course.....Let me tell you...down here in the south we like our pork....but man...when eating those smoked pork chops....my eyes closed with every savory bite...any way...I intend to gift some very lucky people in the same manner. Getting a box of meat is like winning something.